A single button does the math. Just squeeze the trigger and remember your knife. Amazingly compact and simple to use, the Scout 1000 ARC figures distance based on terrain angle to give you an accurate shoots-like distance to 1,000 yards. Rifle Mode even tells you where to hold. With selectable Bow and Rifle Modes, it has the same capability some competitors need to split into two separate units. All with the tap of a button in a vertical unit small enough to fit in your shirt pocket. 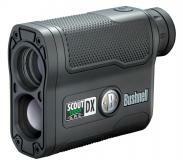 In capability and ease of use, no one comes close to Bushnell. Unmatched ballistic capability. Extreme up-and-downhill angles after true horizontal distance to your target. ARC accounts for the terrain when calculating distance, so you know precisely how to shoot the range.